It's a skill I acquired by trial and error. This was long before the Internet came along as a source for instant information. There were articles in the model railroad magazines from time to time, but essentially you were on your own. Airbrush painting is not a daunting task to learn. 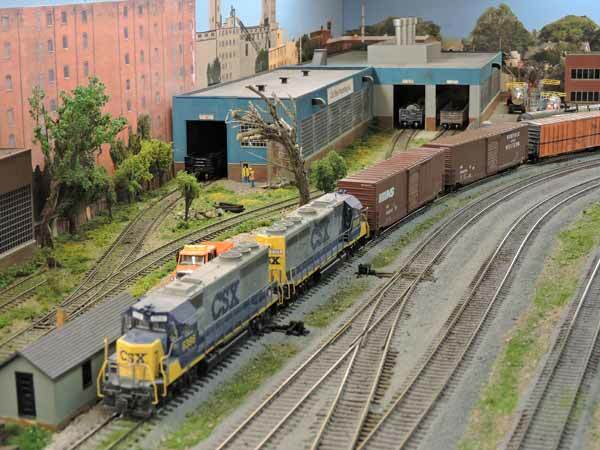 Model railroaders are not using it to paint bodies or lay down intricate designs on automobiles and motorcycles. We mainly use it for laying on coats of paint on rolling stock and structures or as a weathering technique. That doesn't imply we don't want to be artistic, just that we don't have to consider ourselves "artists". For me, the worst part of airbrush painting is the cleanup. I'll cover that further down this page. So go on. Give airbrush painting a try. A couple of key points first. Get yourself a good respirator mask and use it when airbrush painting. Don't rely on dust masks left over from a drywall project. Solvent- and acrylic-based paints have very fine pigments that are easily inhaled. Solvents are the worst culprits as far as your health is concerned and may be carcinogenic. Protect your skin when airbrush painting. Use latex or rubber gloves. (Some people are allergic to latex). You don't want solvents to penetrate your skin and, quite frankly, it's a lot easier to peel off a pair of gloves than to scrub the paint off your skin. Vent the fumes outside when airbrush painting. Use a proper spray booth if you can afford to buy one. Vent to the outdoors through a dryer hose or something similar. Some fumes are not only dangerous to your health. They can also be explosive if the concentrations in the air are big enough. Don't airbrush with solvent-based paints around open flames. That includes your furnace. If you are going to build your own spray booth, make sure you use a sparkless motor to run the fan. I don't have the luxury of a spray booth for airbrush painting at the moment. The old one I built with plywood and a furnace filter got destroyed in a previous move. Anyway it was big and cumbersome. I managed to acquire another one at our annual train club auction. It is also large and unwieldy. It is not vented so for now I do my airbrushing in the garage with the doors open. Sometimes you can't use the spray booth, such as when you're airbrush painting track and ballast on the layout. Sometimes it's easier and faster to use an aerosol spray can for painting track (Floquil Rail Brown if you can find it or any matte brown paint spray that looks right). Always open a window and use a fan to circulate the air in the room and push it towards the window. Close the doors to other parts of your living space. Again, make sure you wear your respirator mask. There are lots of choices. Here are the ones I have used. (From top to bottom): Badger, Paasche, Thayer & Chandler, Testors, and Aztek. I bought my Aztek airbrush in 2006 and now use it most of the time. I like it because it comes with a selection of nozzles that are easy to change and to take apart for cleaning. It is a double-action airbrush that gives me better control. Cups and bottles can be quickly plugged into either side. Airbrushes use either external or internal mixing of the air and paint. External mixing takes places after the paint has left the nozzle and internal mixing happens within the tip of the airbrush. There are three basic types suitable for our airbrush painting needs: single-action, double-action and a combination or hybrid type. Air-flow draws the paint from the bottle or color cup into an angled paint nozzle. You turn the nozzle to adjust paint volume. Pressing the trigger on top controls the amount of air that will reach the nozzle. Release the trigger and the paint stops flowing. Push down on the trigger gives you air. Pull back on the trigger and you get paint. This takes some getting used to. It's a bit like rubbing your head and stomach in opposite directions at the same time. The amount of air is best controlled by adjusting the setting on the compressor instead of feathering the amount of air by pulling back on the trigger. The advantage of a double-action type for airbrush painting is that you have much better control than with a single-action type. This can be important for subtle weathering and complicated paint schemes on locomotives and freight cars. This is an airbrush that combines internal mixing with single-action. An example is the Badger 200. The amount of paint is controlled by turning a knob on the back end of the long needle that slides into the airbrush. The trigger just supplies the air. For airbrush painting, you also have to decide on gravity, siphon, or side feed. My Testors Aztek A470 has small openings on either side into which you insert a small black plug to set up the airbrush for right or left-hand use. Siphon caps or gravity feed cups are mounted on the opposite side. Tip: Practice with water to get the hang of it. Here you have a few options. If you're only going to do a little bit of airbrush painting, consider starting with propellant cans. They'll supply clean air but the pressure drops as the can empties. The can will also get cold if you keep your finger on the airbrush trigger too long. Some people still use an automobile inner tube for an air supply. f you have one of those pumps that plug into your car's cigarette lighter you could go this route. Your best option is a compressor. It doesn't have to be extra fancy. Here's the contraption that served me well for 25 years. This Miller 2000 compressor could be carried to where I needed it. Note the air regulator and water trap. Not pretty but it worked. It was very noisy and it ran until you pulled the AC plug out of the wall. It did have an air regulator and a water trap connected with copper tubing from the hardware store. The water trap is important to stop paint from spitting and ruining your work. 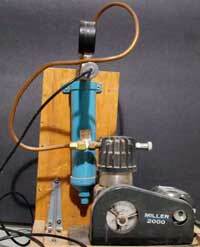 In 2006 at the Toronto Hobby Show I saw a demonstration of an Iwata Spring Jet compressor. It was small, quiet, had a carrying handle and a built-in air regulator and water trap. I bought it instead of another model engine I had my eye on. Airbrush painting has become much easier since I bought this Iwata compressor. It's practically silent. Handles to hold your work. The one pictured here can be adjusted to fit inside body shells for painting. Put it on a lazy susan to turn it. Another one is the spring type made by GB Engineering that you hold in your hand. It makes it easy to rotate the object. Make your own from blocks of wood or foam. Wooden photographic tongs used in darkrooms are an alternative. When airbrush painting small, delicate parts, leave them on the sprues and lightly tack them to painter's or masking tape. Mixing jars: Use empty paint bottles, small jam and baby food jars. You don't need the needles, just the graduated tubes to control the amount of paint and thinner when mixing. Ask the pharmacist and explain what you want them for. Pipe cleaners. You need these to clean the insides and nozzles of your airbrush. There are two basic types: Water-based acrylic (Floquil Polly Scale, Badger Modelflex, Tamiya) and organic-solvent (Accupaint, Floquil, Scalecoat). Organic solvent paints can attack certain plastics. Test first. Use a primer or sealer like Scalecoat Shieldcoat. Handle with care for safety reasons as I discussed above. Acrylic paints are available in most of the same colors as organic solvent paints. They are labelled as non-toxic, but you should still use gloves and a respirator. Note: Most model paints are formulated for brushing so they must be thinned for airbrushing. The recommended thinner-to-paint ratio is often marked on the jar or you can check the manufacturer's website. Experiment on a piece of scrap material. Paint needs to be thoroughly mixed before airbrushing. Some colors (like brown) take longer to mix because there is more pigment in them. Don't skimp on this step. Paints should be stirred, not shaken. Solvent-based paint can be shaken, but you run the risk of paint getting under the cap and flaking back into the wet paint when dry. Some modellers recommend putting a ballbearing or bb into an opened jar of paint to facilitate mixing. Once opened, make sure to seal the jar well when closing. Use some plastic wrap or aluminum foil under the cap. Lumps will clog your airbrush and spoil your work. You can put a screen filter over the siphon tube in a bottle. This doesn't help you if you're using the cups. Micro-Mark makes a funnel/strainer that eliminates this problem. It is just as important to make sure the thinner is free of impurities. Don't put used thinner back into the original container. I keep a separate jar of used Diosol for weathering purposes. It is also not wise to put the thinned paint back into the original bottle because if you ever want to duplicate the shade you won't have the same ratio of thinner to paint. If you expect to use the thinned paint again (or you have mixed colors together to make a special shade), keep it in a spare bottle and affix a piece of masking tape to the bottle with the mixture written on it. Make certain the piece you want to paint is well-lit so you can check the coverage when you're finished before cleaning and putting away the airbrush. Use the type of lighting that is illuminating the layout. Don't mix florescent and incandescent. You can also use photographic lights that are very bright and balanced for daylight. Test spray onto a similar piece of material to check paint consistency and to make sure it is flowing properly. Hold the airbrush nozzle from 3" to 6" from the work (depending on the nozzle and spray pattern) and apply in smooth, even strokes. Start spraying by pushing down on the trigger before you reach the edge of the piece on which you want the paint. Spray across the piece holding the airbrush the same distance from the work. Go past the edge of the piece and lift your finger off the trigger to stop the paint. Overlap the edge of each stroke on each pass. Rotate the work and spray in another direction. You want to end up with an even coat in all directions. Paint should go on wet and shiny and dry quickly. If you apply the paint coats too heavily and too quickly, the paint will become thick and start to run. If it dries before it reaches the surface you are painting, the finish will be rough like fine sandpaper. Every paint behaves a little differently. For example, I was advised that Modelflex has a tendency to go on wetter which turned out to be the case. Another reason to test on some scrap. If you are new to airbrush painting, start with a simple project like painting a boxcar or brick wall with one color. You might also like to try using a spray can first to get the feel of doing even strokes at the same distance from the work. The airbrush will give you finer control. Lay a piece of painter's tape on a sheet of glass.Use a metal ruler and a very sharp blade to cut a new edge on the tape about an 1/8th of an inch in from the tape's edge. This will give you a sharper edge for masking the separation between two colors. Don't use regular masking tape. It's too sticky. Try something like Frog Tape or the green painter's tape. Press the tape down firmly so paint can't crawl under the edge. Microscale makes a Masking Liquid you can try. Take time to be sure all the parts are covered that you don't want paint to reach. Start with the lightest colour. Move onto the darker colour(s). Leave plenty of time between coats to allow for drying. Sniff the model. If the paint still has a strong odour, wait longer. 24 hours is a good rule of thumb. Peel the tape back on itself slowly with a sharp, 45° bend. Airbrushes have to be thoroughly cleaned immediately after use. If you let paint dry in them you'll have a tough time getting them to work properly. I completely disassemble the airbrush and soak the spring, needle and nozzle in the appropriate cleaner. A pipe cleaner is used, along with a rag, to clean the inside chamber. I use ordinary lacquer thinner when I've painted with the solvent-based paints. This is cheaper than using the specialty thinners. Clean tap water is used to rinse out the airbrush when I've used acrylics. [Some experts advise using distilled water to avoid impurities.] I take extra care to get the nozzle clean on my Aztek brush. Sometimes I need to flush the Aztek with water or lacquer thinner during a painting session because paint has dried in the nozzle while spraying. Then I reassemble the airbrush, hook on a bottle of thinner and spray the entire contents through the nozzle to flush the airbrush. I spray into a Kleenex tissue to see if any paint is still coming through. Finally I wipe out all bottles and cups I've used and close the paint jars securely. If you use an airbrush that has an internal needle (double-action type), wipe the needle with oil before storing it away. Tip: I got this tip from Cody Grivno's video on airbrushing on the Model Railroader magazine website. Use Windex for cleanup of your airbrush parts when using acrylic paints. Adjust the air pressure lower, make sure the paint is well-mixed, without lumps and thinned correctly, and that you are holding the airbrush close enough to the work so the paint doesn't dry before it reaches the surface. This is often caused by a damaged or worn needle. Low air pressure can also cause this to happen. You're spraying too far beyond the intended target area. This can also cause back spray in a paint booth if the fan isn't dispelling air quickly enough. You run the danger of getting paint on unmasked areas. Either the masking medium isn't pressed down sufficiently or you're applying too much paint. Use light coats and try to spray at an angle. Cleanup can be the most frustrating moment in airbrush painting. It probably means there's some dried paint gumming up the works. Take the mechanism apart, inspect it and soak the offending parts in cleaner. Forget about painting today. Go run some trains. I've added more tips about airbrushing and other modelling tips from the clinics at the 2012 Sudbury NFR-NMRA convention at model building tips. Return from "Airbrush-painting" to my Painting model trains overview. Go to Weathering tips and techniques. Return from "Airbrush-painting" to my Home Page.